If you are interested in making your own custom refurbished football helmets, one of the more difficult aspects of the projects is finding the correct paint color to match the on field team colors. If you are new to the hobby or working with a budget, using ordinary spray paint is your best bet. There is a wide variety of paint colors and textures that are available that will allow you to get very close to the authentic colors for your display helmet, without hiring a professional or mixing paints yourself. This page is meant to be a guide and I will add or replace the listed paints as I find more accurate colors or the paints become unavailable. If you find a paint that matched well, add it to the comment section or let me know on Twitter Or Facebook and I will add it to the list. Check back often for updates and more teams added. The Arizona Cardinals have a gloss pearl/metallic shell with a classic gray facemask. The metallic/pearl shell can be replicated with the metallic helmet technique. Like most NFL helmets, the Atlanta Falcons current helmet uses a slightly metallic Gloss Black. You can buy Metallic black, but i have found that the Metallic black paints will not give you as deep of a black as you would need if you want to simulate the on-field colors. I would go with Gloss Black then add a very light coat of Metallic silver to the final coat using my Metallic helmet technique. Like most NFL helmets, the Baltimore Ravens current helmet uses a metallic Gloss Black. You can buy here. The Carolina Panthers have a sparkling silver metallic shell and a black facemask. 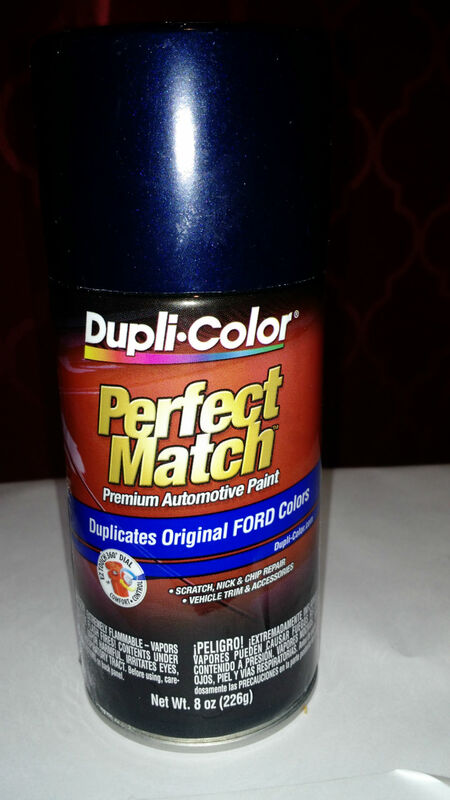 Any silver metallic paint will simulate their on-field metallic silver appearance. Gloss black will work for the facemask. For the Bills current helmet they use a Gloss white pearl with a classic gray facemask. Finding a white pearl spray paint can be difficult, so once again I would recommend using my metallic helmet technique after the final coat of gloss white. The Bills throwback uses the same shell and facemask as the current helmet. The only difference is the decals which are changed out for the throwback games. If you wanted to make an authentic 1960s Bills helmet you would use just gloss white and not add the metallic or pearl to the paint. For the red shelled helmets used between 1984 and 2010 use a Gloss Red. For my custom Red Bills helmet, I made the shell metallic, but the shell was not metallic for most of the red helmet era, specifically during the late 80s and early 90s. I used banner red as a base coat and went with the Red metallic shimmer for the final coat. You could also use the metallic helmet technique. The Denver Broncos have a metallic navy blue shell with a monochromatic Facemask. Use metallic helmet technique. The Giants have a bright metallic blue shell and a classic gray facemask. The Jets have a pearl white helmet shell and a dark green (hunter green facemask). Use metallic helmet technique to get pearl like finish on the shell. The Packers have one of the more trickier helmet shell colors in the NFL. If you go to the paint section of your hardware store you will notice that the selection of yellow just does not match the shell of the Packers. The Packers officially consider their yellow color Gold. I would consider it dark yellow in all reality. When it comes to rattle cans, your options are pretty limited for the Packers if you want an on-field match. 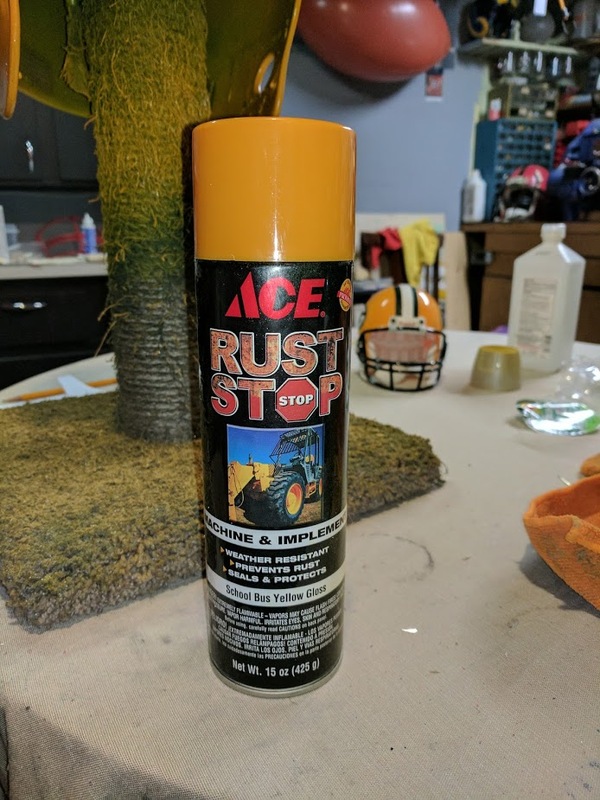 You can order custom paint online or at a local paint store and they can put it in a spray can for you, but due to the minimums they set it can be pricey. If that is something you would be interested in, the official Pantone Color system code for Packers Gold is PMS 1235-C. Otherwise you can go to Ace Hardware and pick up a can of School Bus Yellow Tractor paint. It costs about five bucks and is a really heavy duty paint. I mean it, this is some serious paint. 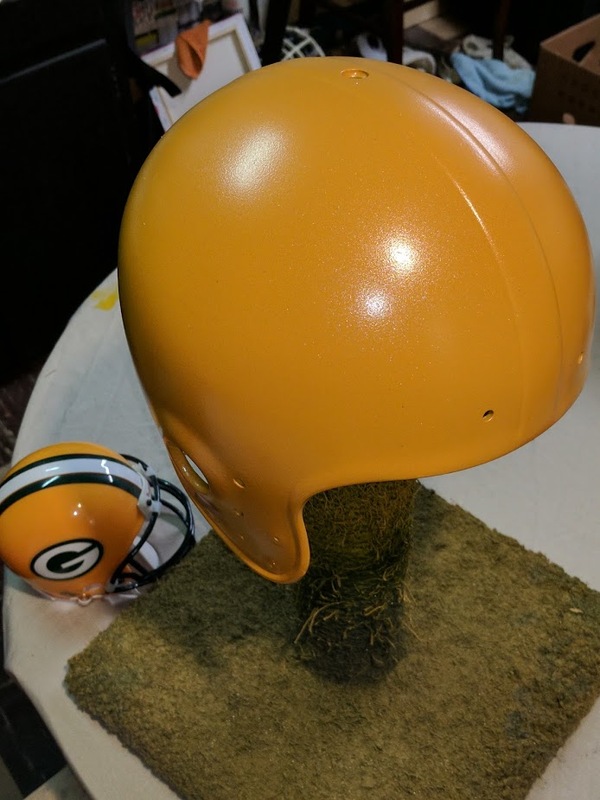 I was covered in yellow after painting my Packer helmet. To get the metallic finish you will have to use metallic silver and lightly spray from a distance using my metallic helmet technique. The Rams shell is a deep metallic navy blue with a monochromatic facemask. I used Dupli-color for my helmet. See my custom Rams helmet Here. The Raiders have a metallic silver shell. with a classic gray facemask. See my custom Raiders helmet here. The 49ers have a metallic gold shell and a classic gray facemask. There are many different gold paints to choose from, some match the niners lid more than others.